California’s Premiere Mazda Only Event Returns. The Mazda Family reunion is back for 2018 with a HPDE track day hosted by Extreme Speed and Mazda Owners Club of California. Registration for this year’s track event is now open for Beginner to Advance levels! HPDE Track time, Mazda Only Car Show, Vendors, Raffles, Games, and Door Prizes. What other event has so much Mazda Love packed into one place!? Our exclusive ONLY Mazda event brings Mazda owners and enthusiasts together to drive, share, and enjoy the cars we love. Our All Mazda track day provides the opportunity for Mazda drivers of all levels to participate in on-track activities and beginner instruction. Timing transponders are included. 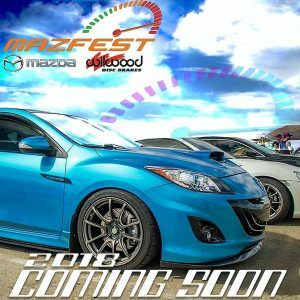 Participate in our all Mazda car show for the chance to win great prizes and our official MazFest trophies. Car show categories are announced two weeks prior to our event. Mazda vendors are on-site to provide great deals and new products for Mazda owners and enthusiasts. Strap in and hold on while riding shotgun in a real Mazda race car. Our pros will take you around the track at full speeds and give you the ride of your life. Our Mazda only parade laps take place after car show judging is complete. Regardless if you are participating in the track or car show portion of the event, and you drive a Mazda, you are welcome on track. Copyright 2012 - 2019 © MazFest, All rights reserved. Please complete form below to pre pay for event gate entry. Tickets are $15 Per Person.